Like many people, I reacted to the 2016 US election outcome with shock, horror, disbelief, sadness and despair. I cried all morning on November 9th, and I was still crying five minutes before I had to teach a class about climate change, culture, and emotions. The readings included Kari Norgaard’s article “We Don’t Really Want to Know” Environmental Justice and Socially Organized Denial of Global Warming in Norway. I made it through the 90 minutes. It was actually therapeutic to talk about how worldviews, values and beliefs influence understandings of climate change, and to raise the important and rarely discussed role of emotions. The topic was highly relevant to the political upheaval we are facing today, especially since climate change may end up being one of the biggest and most dangerous long-term consequences of the election. Like many people, I love the idea of transformation, as in “the butterfly effect.” I love the prospect of liberating myself from my own limitations, changing my outlook, and realizing new possibilities. I am fascinated by the idea that when a butterfly flaps its wings, it can change the world. Yet when it comes down to it, do I really want to give up the security, stability, and comfort of the familiar — even if it is sometimes less than ideal? No, I would rather tap dance around the edges of change, sampling a bit here and there and pretending that it is transformative, rather than taking a plunge into the unknown. Watching the election returns come in during the middle of the night and seeing Florida “go red,” county by county, I realized that the plunge was now imminent. I cried. Why would a state that will be submerged by rising sea levels choose a party platform that demands “an immediate halt to U.S. funding for the U.N.’s Framework Convention on Climate Change (UNFCCC).” It felt like a vote for collective suicide, not just for Floridians, but for all of us. To shrink or to grow? When crisis hits, we either shrink or we grow. We may feel like we are staying the same, merely holding onto what we believe in as an act of conservation. But this security is often an illusion because the world is always changing and so are we. To contract in fear when faced with change is to shrink to a smaller sense of self. To do this we usually put up defensive and protective borders against anything or anyone that is not like us or who does not share our ideas and values. We surround ourselves with “people like us” to create a world that appears more manageable. Unfortunately, this world becomes ever smaller and more limiting as our fears grow. We hardly notice it, for when we are immersed and secure in “our” world, we tend to be oblivious to the world of others. Alternatively, we can choose to grow, and we do this by confronting our limiting beliefs, facing our fears, disrupting our habitual patterns, and daring to be connected to rather than disconnected from other people, nature, and ourselves. We grow by recognizing that what we stand for matters, but that there is a difference between standing for the well-being of some versus standing for the well-being of all. We grow when we recognize that we are responsible, that we have an ability to respond in a reflexive and mature manner, and that we can choose love over hate and courage over fear. Transformations can be regressive or progressive — the choice is ours. My automatic response to the election outcome was to shrink. First I wanted to hide under the covers and avoid everyone. Then I wanted to find out if I could become a citizen of Norway, the country where I have lived for the past 20 years. I wanted nothing to do with a country that did not respect all people, all species, future generations, etc. It was only after a day of deep despair that I started to gain perspective and realize that like climate change, this represents an adaptive challenge that forces us to look at ourselves and our assumptions about the world. It means that we have to live today what we believe, yet also be willing to explore our deepest beliefs about who we are and what is possible. We have to dare to connect and to build relationships rather than barriers and walls. The stakes are high, the risks are real, and if we do not meet the adaptive challenge, we all fail. There is serious work to be done in the practical, political and personal spheres of transformation, and we are ready. The first small sense of hope came from my 15-year old daughter, Annika, who gently assured me that we will get through this. 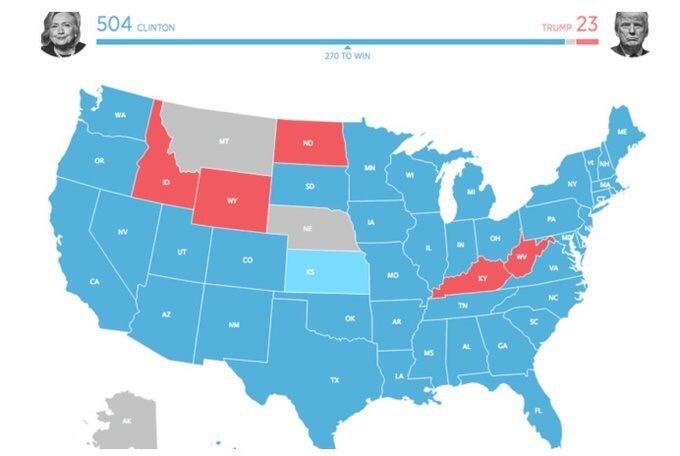 When I looked at the electoral map representing the votes of 18 to 25 year olds, it was almost all blue. The progressive values are here and change is happening, and Annika knows this. She woke up early and made us all a special breakfast to try to cheer us up. 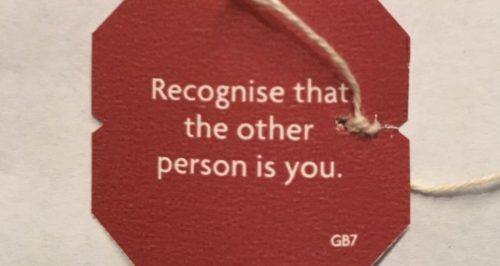 On my teabag tag was the message “Recognize that the other person is you.” I smiled. That is probably the best argument I can think of for pursuing progressive transformations, and for growing rather than shrinking in the face of change. We need to get to work.